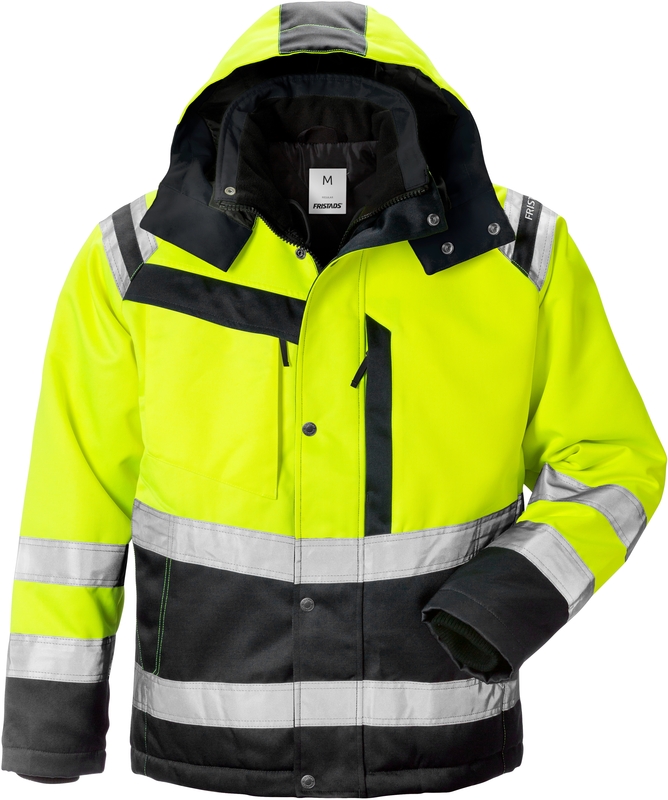 Durable high visibility winter jacket, made of dirt, oil and water repellent material with soft quilted lining. Approved for 60 degrees industrial laundry. Material: Polydex, 100% polyester, dirt, oil and water repellent. Quilted lining 100% polyester. Weight: Outer fabric 255 g/m², lining 190 g/m². 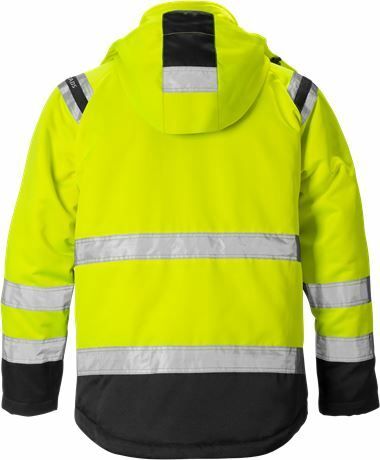 Polydex, dirt, oil and water-repellent / Fully lined / Reflective detailing on shoulders / Front placket opening with zip to top of collar and snap fastening / Fleece-lined collar / Detachable lined hood with adjustment strap and drawstring / 1 bellowed chest pocket with flap and hidden snap fastening , ID-card holder and D-ring inside, 1 vertical pocket with zip / 1 chest pocket with zip / Map pocket with inside mobile phone pocket accessible from outside / 2 front pockets with zip / 2 inside pockets with zip / Adjustable hem with drawstring / Elastic inner cuffs with thumb grip / Adjustable sleeve end / Extended back / Zip in lining for easy embroidery and transfer / Approved according to EN ISO 20471 class 3 and EN 342 / Leasing laundry-tested according to ISO 15797 / OEKO-TEX® certified.